Im here to present the updated and continued version of MyrkMods Herblore Patch! Credits to Intaler for the Tobacco and Toke textures! Credits to ElpiusAmpora for other item textures! Confused about the new 2.0 update? Pipes can be smoked with by holding right click. It will consume one grinded bud from your inventory. Joints can be stacked to 4. The hookah can be activated by a right click with flint and steal. This will consume some toke from your inventory. The next right click will smoke it. The more you smoke the darker the screen will get. Smoking grants minor health regeneration and movement speed. If the high gets above 8 minutes you will overdose. Planting the seed will place a hemp plant. Destroying the hemp plant will return a hemp leaf. Hemp will grow 2 blocks tall before growing a toke head on the 3rd. The toke head drops toke bud, and has a random chance to drop seeds. I recommend only harvesting the middle of the plant when fully grown, since the seeds are rare. The drying table is used to dry toke bud or mushrooms. The table doesn't require fuel but must be placed in the sunlight. Grinding has stayed the same. Here is a video AvailableWzrd created to demonstrate the update. Remember to check the Changelog every update! I have to right to completely ignore your question if its answered in the F.A.Q. Who is this mod aimed at? Single player adventurers who want to spice up their world! This mod has been made to add to minecraft without outweighting the balance of the game, without giving diamonds for dirt. There is no generation code in this mod, so you wont need to restart a new minecraft world to play, you just install and starting toking. Now toke is famous for its proven healing effects, so we decided to bring it to minecraft. To gain toke you must find a village. In the village there is a random chance that one of the houses will spawn a hookah and drying table inside with toke growing in the backyard. Along with the house comes a dealer villager that wears a dark blue robe. You can trade with him for seeds and bud. When you harvest that toke, you can plant them just like sugar-cane and start your own toke farm. Be careful where you plant it, if you break the base again it wont give you seeds back. To feel the healing effects of the herb, it must be smoked. So how do i smoke it? To feel the benificial healing effects of the toke, you must smoke it. You can smoke it in many ways. Through a glass bong, pipes, joints, cookies, brownies and hookahs! Smoking it will heal your health immediately, but give you the munchies. Consuming the cookies and brownies will refill your hunger bar! Once you have obtained some toke bud, dry it in the drying table to produce dried bud. With the dried bud in your inventory, hold right click with grinder item and it will slowly convert it to grinded toke bud. Bongs heal a considerable amount of health and have 3 uses, but are annoying to craft since you need to be near a crafting table to pack it. Pipes are a more efficient way to smoke it, you can craft the pipes out of wood, stone, iron, gold, and diamond. The better the material you make it out of, the more health, longer high and less of the munchies you get. The joint heals heaps but uses a lot of toke! When smoked it leaves you with a roach which can then be smoked in the bong or crafted into a new joint. For some of the updated recipes check this out! Made by grandecarinha. 1. Install the latest version of Forge. 2. Drop the downloaded .zip into /mods folder. 24/03/14 - 2.1g Changed the code so that the seedlings will generate in any biome with the biome registry of FOREST. This should allow them to spawn in modded forest biomes. 23/03/14 - 2.1f Removed Dealer Villages. Added toke and tobacco seedlings that generate around forests. 14/09/2013 - 2.1e Improved the high effect, by slowing the player and smoothing their mouse movement. Milk no longer cures the high, munchies or trip. Made the special toke overlay optional, since it wasnt working for some people. Other miscellaneous fixes and changes. 27/07/2013 - 2.1d Fixed server crash. Fixed villagers. Dealer houses now spawn with either tobacco or toke in their backyard. 12/07/2013 - 2.1b Updated to MC 1.6.2. Reduced item IDs. Lots of internal code changes, getting ready for the new high system. 15/05/2013 - 2.1a Updated to minecraft 1.5.2. Drying Items render on top of the table now. Drying table requires full sun. Increased toke seed drop rate from 1/5 to 1/3. Bongs are now crafted with glass panes instead of glass blocks. Changed hemp recipes around, rope now requires thread. When on a toke high you now get paranoid. Reduced the harshness of the toke high overlay. Added a colour trip to the shroom high. Changed "Nausea" potion effect name to "Trip". Removed the toke high overdose. Changed the textures of Sanded Wood, Pipe Filter, Joint, Grinders, Hemp, Toke and Rope. Tobacco can be used to create Cigars and Cigarettes. Smoking tobacco can give you resistance and damage boosts. Hemp rope now works correctly. Various bug fixes, including the MCPC+ bug. (I hope) 24/03/2013 - 2.0d Updated to minecraft 1.5.1. 20/03/2013 - 2.0c Fixed joint bug. Fixed magic shroom bug. 17/03/2013 - 2.0b Fixed critical texture bug and other various bugs. 17/03/2013 - 2.0 Updated to MC 1.5. Revamped the whole high effect. Changed the pipes to no longer need a crafting table to be packed. Added a dealer villager with a dealer house. Added the drying table. Added a hookah to smoke with. Added hemp. Added magic mushrooms. Converted to Forge. Added SMP compatibility. Fixed miscellaneous bugs. 2/11/2012 - 1.5 Minor changes. Removed drying table. Updated to minecraft 1.4.2. 1.4.5. 1.4.7. 18/08/2012 - 1.4.2 Minor changes. Updated to Minecraft 1.3.2. Added worldgen. 11/8/2012 - 1.4 Cleaned/Re-wrote code. Removed bugs. Drying table still doesnt work. (ModLoader problem) Grinding is now more interactive. (Hint: hold right click) Toke crop changed back to sugarcane-like plant. Removed smoking actions for compatibility. No more base class edits! Bong now has 3 uses. Villagers now deal toke. Toke no longer drops from tall grass. Can now be installed into the /mods folder. Grinder now gets clogged and gives you kief. Smoking no longer takes food, but gives the hunger negative potion effect. 6/8/2012 - 1.3d Drying Table Temp-fix (Now dry toke in furnace). 5/8/2012 - 1.3c Quick update to MC 1.3.1. 8/6/2012 - 1.3b Fixed grinder dupe glitch. Fixed toke not grinding glitch. 5/6/2012 - 1.3 Changed toke to grow like wheat now. Added toke seeds. Removed grinding table. Grind toke with the item in the crafting table now. Added Config File! Thanks to MiniatureTuxedo for helping me with updating the source code from b1.8.1 to 1.0! Thanks to Spaces for helping me out with the earlier versions of the mod! Thanks to the Myrk brothers for starting this wonderful mod! Thanks to Vazkii for miscellaneous code help. Thanks to Intaler for the tobacco and toke textures. Thanks to ElpiusAmpora for some item textures. Quote from original owner, Kmyrk. I heavily discourage anyone from taking/stealing/borrowing/or using any bit of calebmanley's code, texture, or any other media that he has worked on without his permission. The only material that people can use is what I made available upon the original myrkmod thead. If you don't want to update the code or textures, and if Caleb doesn't want you, then your SOL. I give my full support behind calebmanley and his uptaking of my project. It was hard letting it go, but having Caleb pick it up and to see it being updated and used by so many people makes me proud to have been part of a project that has now turned into something quite special. Thank you Caleb for continuing on the myrkmod herblore project! I do not condone the use of illegal substances. You must not redistribute, repackage or mirror the direct download link. If you want to share the mod, tell them the adf.ly link or forum post link. If you make a video/spotlight I would appreciate it if you linked back to this thread in the comments. You must not edit, and redistribute the contents of this mod, and share it as your own work. This mod(Herblore) is Copyright (calebmanley) and is the intellectual property of the author. It may be not be reproduced under any circumstances except for personal, private use as long as it remains in its unaltered, unedited form. It may not be placed on any web site or otherwise distributed publicly without advance written permission. Use of this mod on any other website or as a part of any public display is strictly prohibited, and a violation of copyright. 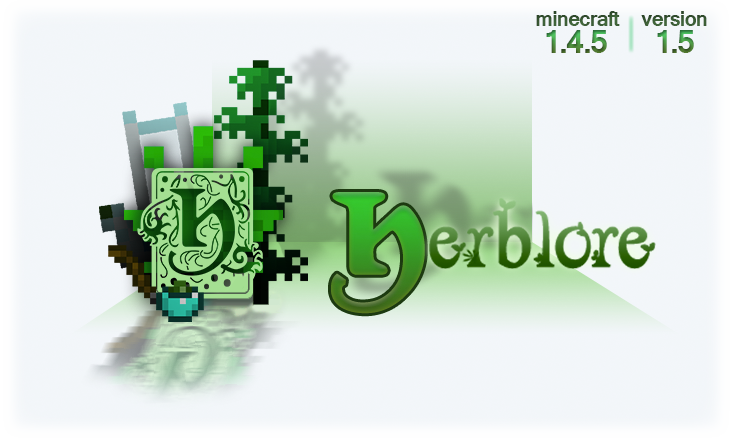 Herblore may be used in your mod pack so long as you give credit where due and link back to this thread. I would appreciate it if you also send me the link, this is not required though! If you are adding this to your website or creating a video, please provide a link back to this thread. Do not mirror the download link, only provide the adfly link. Then, I discovered that this was a mod that incorporates the equivalent of weed into minecraft. And by the time you read this, I'll have left this thread. I play a lot on OniCraft, with several of my friends. We really like to build industrious semi-vanilla cities, make them reach a point of near self-sustenance, and then sacrifice the profited items to the Gods. It sounds scary but it's kinda neat. Oh, also, I make weird music. Then, you discovered that this was a mod that incorporates the equivalent of weed into minecraft. And by the time I read that, you had left this thread. Next update may be out this weekend :smile.gif: stay tuned! am i the only one that decided to smoke some after reading all of this? Why not make a Drug Mod Where ALL the drugs are,would be AWESOME! Life is like Money,Don't Waste it on Useless stuff. Yeah i know but Not All the Durgz but like "cocaine" and **** like that. But love how this mod is growing! caleb, Has your avatar been using that toke? Hey guys, In 1.2 SMP will be supported and in later versions I will add Bukkit support. How do you grow it? Is there some way to get seeds or what?